In March of 1999 The Foundation for Lee County Public Schools contributed $50,000 into a fund at FGCU (Florida Gulf Coast University) which the FGCU Foundation matched. The $100,000 fund was then matched by the State of Florida. The fund was established at FGCU Foundation to provide a means to financially assist deserving Lee County teachers wishing to improve their teaching skills through courses at FGCU. 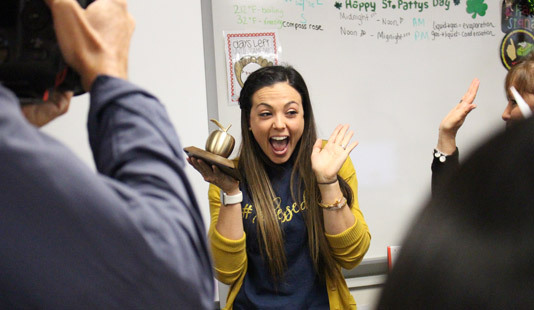 Each teacher applying for the Golden Apple Teacher Recognition Program™ may also apply for a scholarship for one 3-4 hour graduate or undergraduate course at Florida Gulf Coast University and up to $100 for related books. Eligibility: Only teachers who submit a completed Golden Apple Teacher Recognition Program™ application may also apply for this scholarship. Applications, consisting of four questions, are to be sent to the Foundation for Lee Co. Public Schools electronically. Applicants are notified by email upon receipt of their application. A Selection Committee of community volunteers read the applications “blind”. Applications are due to The Foundation by: January 18, 2019. Criteria: 1. The course must enhance teaching (not for administration). Between 5-10 applications are awarded each year. Florida Gulf Coast University Foundation determines how many will be awarded after receiving a list of applicants, in ranked order, we submit to them. The number awarded depends on whether the highest ranked applicants applied for Graduate or Undergraduate class and how much funds are available in an annuity we have with FGCU. The scholarship will be valid from July 1, 2019 through June 30, 2020 (4 semesters).